Abakundakawa Rushashi became This Side Up's first partner in 2013. With a water- and energy saving triple fermentation method, advanced pulp recycling methods and two women empowerment organisations, Rushashi coffee washing station (CWS) is truly progressive. We created the country's first cascara with them in 2015 and since 2016, increased traceability by offering "village lots" from only several of the washing station's twelve collection points. In 2017-2018, they rocked the European coffee scene with a killer natural experiment that we plan to keep in our assortment in coming years. 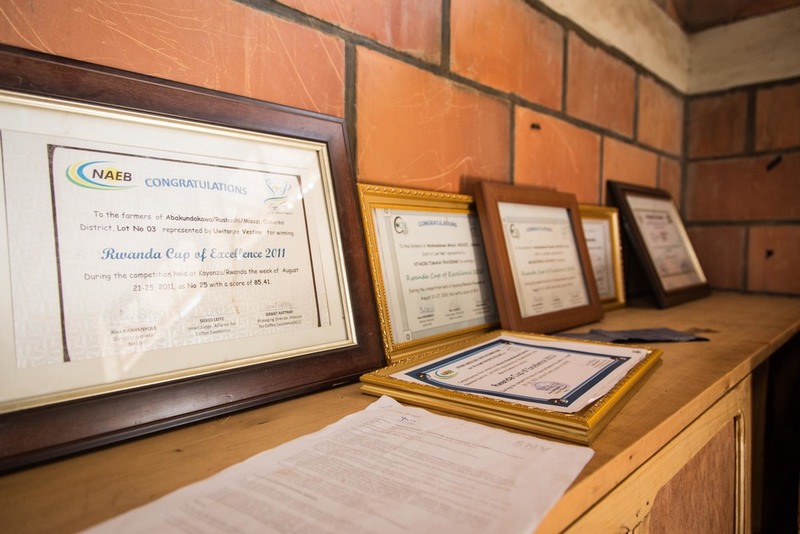 Rushashi serves as a prime example of how Rwandan cooperative societies can become sustainable by constantly improving quality and operatig sustainably. With the help of MISOZI, a local private but social exporting business, they are able to sell their unforgettably complex coffees worldwide - it's no surprise that they frequently earn a place in the Rwanda Cup Of Excellence competition (highest: 3d place!). For three years, This Side Up's premium has been invested in Rushashi's financial independence from rural banks by the cooperative's members, while from 2017 onwards, we have been investing in a nursery for shade trees and other plants that organically strengthen the coffee. Our Rwandan coops are a good example of farmers taking control of the value chain. Instead of selling their coffee to a mill or exporter, they rent the milling and exporting service and make direct contracts with buyers such as This Side Up. More control, more independence from market prices! Since 2016, we are pioneering "village lots". We have two lots collected from of our favourite collection point lots on the cupping table: Minazi and Burimba. Organically produced (not certified), Fair Trade certified, emphasis on women empowerment, several Cup of Excellence awards. 2016: export of cascara approved, first village lots created and exported: Burimba and Minazu. 2017: new village lot created (Rutabo), first PB and high grade natural lot imported by This Side Up. 2018: After the success of the experimental natural lots, we created two natural village lots: Rutabo and Minazi. Nursery for shade trees and other organic intercrops created with our premium. 2019: starting agroforestry trials on a microlot close to the Rushashi washing station. fully washed and triple fermented: all coffee is hand picked, depulped, dry fermented for 12 hours, double wet fermented (2 x 18 hours), washed with mountain water, shade dried, then sun dried on raised beds. naturals are shade dried, then sun dried and consistently turned to achieve the lowest possible amount of defects. the price you pay for the Minazi Washed p/kg. This Side Up pays $ 7,10 to Abakundakawa (FOT Kigali), which is 2,27 x the Fair Trade base price. We agreed on this price directly with the farmers, disregarding the volatile US Coffee C price. 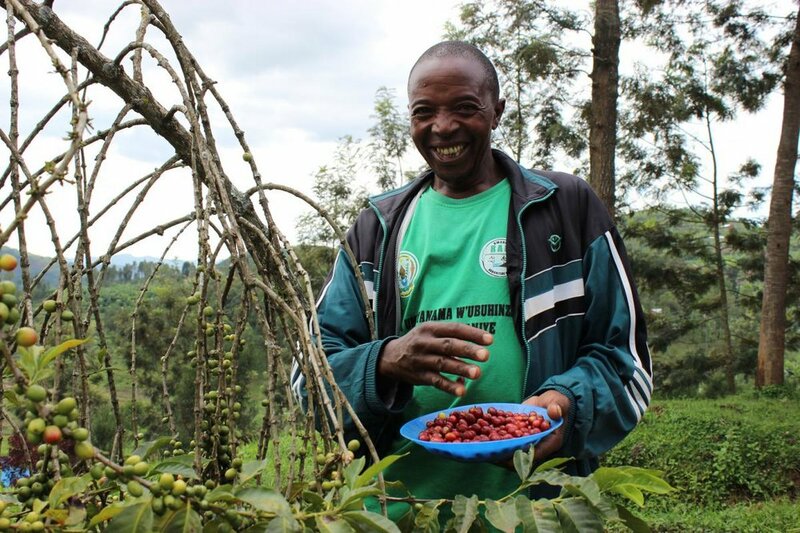 the price Abakundakawa pays farmers for their cherries as p/kg price of green (milled) coffee. This price is often unknown to buyers. The extra €1,68 is our premium that goes towards creating a fully natural agroforestry system in which the coffee should grow from 2023 onwards. wet-processing costs and coop management fee + dry-milling costs and exporter fee. total shipping costs from Kigali, through customs and to our warehouse. We fill our containers with as much coffee as we can or hitchhike with other importers to keep these costs to a minimum. This Side Up compensation for spending time and resources importing this coffee. Our work includes building relationships with shipping and warehousing partners, managing export, import and shipping bureaucracy, Q grading, sampling and jointly promoting this coffee with Misozi and Abakundakawa Rushashi. Average financing cost (5% of the sales price) we have to pay lenders - simply because we don’t have the money in the bank to buy such large amounts of coffee all at once. This ensures immediate payment to the farmers when the coffee leaves the farm or port. After some tinkering, we finally got the air flow right on the "TSU Washed 1" profile, getting the look of these beans as uniform as possible (Rwandan beans tend to look darker than they taste). This roast makes the washed lots into sweet fruit bombs and allows the tea and floral notes to shine as well. For the natural, we use Sebastiaan Geistdorfer's great and simple natural profile below. You may use these images freely to promote Rushashi among your customers. Rushashi's manager, Antoine Kagenza is always eager to develop relationships, hear from customers or enter into exciting new partnerships. Give him a buzz or let us introduce you. Rushashi Coffee Washing Station (CWS) is the largest of two washing stations owned by the Abakundakawa coffee producer cooperative, one of This Side Up’s first partners. 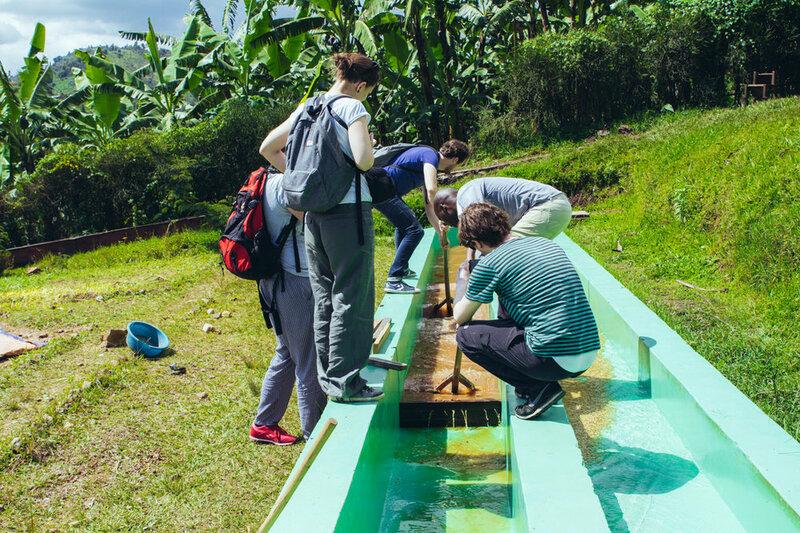 It is located in the lush and green Gakenke district, characterised by high spiky hills at high altitude - making it ideal for high quality coffee production. 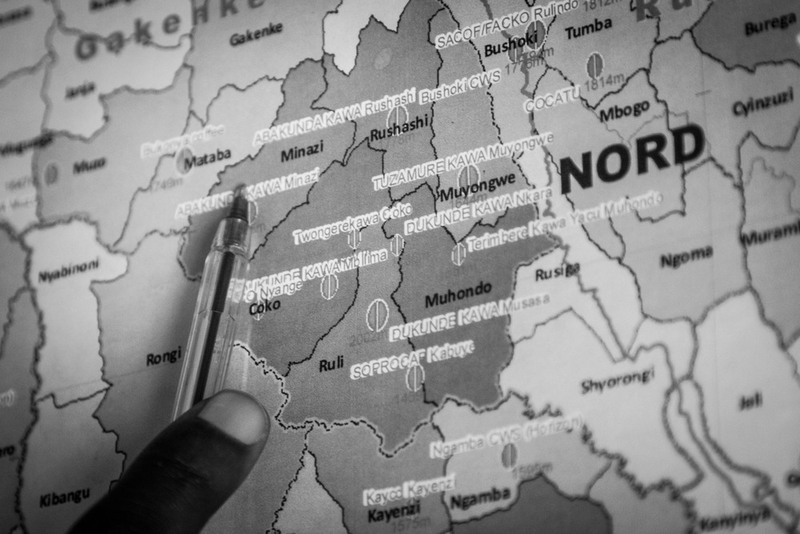 It is no coincidence that this region produces some of Rwanda’s most sought after coffees. Abakundakawa has come a long way since it started as a smallholder farmer association in 1999. It became a recognised cooperative in 2007. Since then, in a relatively short time, Abakundakawa managed to become an advanced operation with over 2000 member farmers, that serves as a prime example of how coffee growers can turn the specialty market into a seller’s market. We were truly amazed by the standards this coop conforms to: it has the facilities to roast and cup samples on site, employs a full range of organic processing methods (and is on its way to become certified organic), provides full transparency in its bookkeeping and in recent years has received technical and leadership trainings from the Rwandan government and development agencies - especially from SNV, This Side Up's trusted development partner in Rwanda. 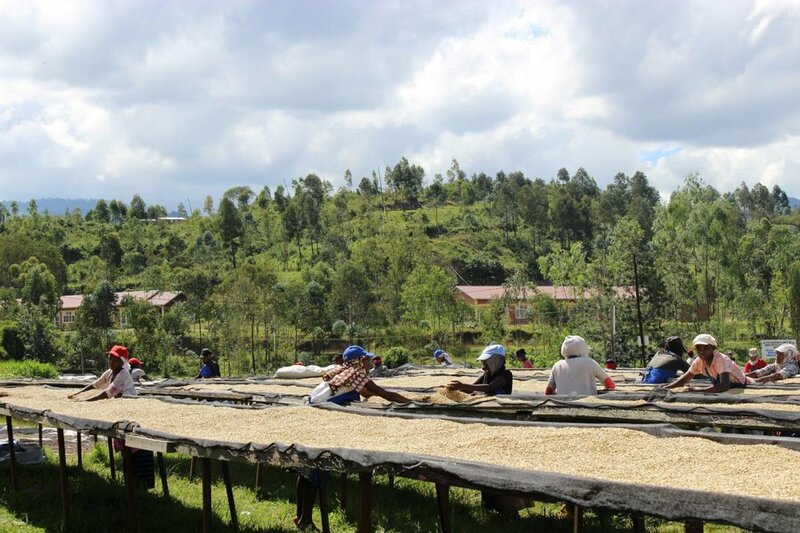 In terms of processing, it employs a particularly long fermentation process that has been adopted by several nearby cooperative societies, and has likely contributed to the bronze medal they earned at the 2010 Rwanda Cup of Excellence competition. Abakundakawa is also a good example of how Rwandan rural society is managing to deal with the horrors of the past in a hopeful and inspiring way. During the genocide, many Rwandan women lost their husbands and were forced to take care of not only their own but many orphaned children. These women started to organise themselves in special women empowerment organisations, but in recent years have also learned that the label “produced by women” has a marketable value, and now sell their coffees separately at a premium. This in turn has sparked a discussion among traditional households (with husbands) about ownership of the coffee trees. 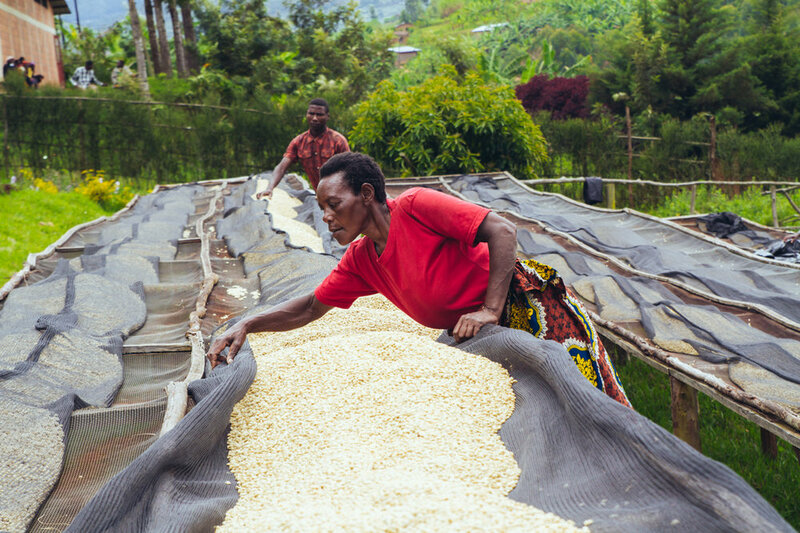 In Rwandan smallholder families, the coffee trees are owned by men - but if women receive a premium for their produce, it can benefit all financially to pass some of this ownership to the women in the households. This development is slowly but steadily helping Rwandan women’s emancipation and position in society underway. Abakundakawa distinguishes itself by supporting two very successful women empowerment organisations: Duhingekawa and Abanyameraka. These organisations represent most of the 740 women out of the coop's 1961 members and fight for improvement of their position in local society. We visited Rushashi for the first time in December 2013 and explained that This Side Up is uncovering a new specialty market of small roasters in Europe, and Antoine and his peers greeted us in high spirits and with high expectations. After a great harvest in 2013, This Side Up has again committed to this inspiring coop's 2014 harvest and is pleased to offer it here! Despite all these impressive efforts, Abakundakawa is faced with a high risk of demotivation among its member base: the farmers hardly see the fruits of their increased efforts as they simply haven't found enough buyers for their valuable crop. Antoine Kagenza, the coop's manager, told us that the coop has reached a critical point: their coffee production quality is at its very highest now - if this does not get noticed and rewarded soon, financial means, motivation - and subsequently coffee quality - will start to drop again. For this reason,This Side Up's 2014 premium for Abakundakawa was simply used as a financial buffer against a possibly disappointing harvest season. Abakundakawa's general member assembly is held every year on January 15th. The report stated that this year, This Side Up's premium (2520000 rwf.) was unanimously agreed to be used for paying back the cooperative's long-term loan. Borrowing money from rural banks is commonplace all over the world of coffee because of a simple fact: harvesting coffee takes place before selling coffee, while the cost of harvest is by far the largest short-term expenditure for a coffee grower. Anything that can be done to reduce unnecessary revenue being paid as interest to banks (the rate is 14 to 20 percent!) means more money for the cooperative's member farmers! We visited the coop in April to make plans for the 2015 harvest. Not only is the harvest looking good after a reasonably slow start, but we are developing Rwanda's first cascara from wet-milled pulp together. Our October shipment arrived in Rotterdam and is cupping more sweetly and cleanly than ever. Bravo Rushashi! This year's premium was again added to the coop's savings account to lower credit necessities. Our aim is that Abakundakawa can soon have a buffer so large that they will never need credit again. Abakundakawa has been very active in experimenting with cascara since our first trials in 2015. This year, we will offer the country's first exported cascara, 600 kg of nutritious dried cherry with strikingly clear notes of honey, jasmin and black tea. We also looked into creating more traceable lots together with Misozi. It turns out that the coffee that is collected from one of the washing station's twelve collection points is processed separately in a single day and labelled separately too - only to be blended again after cupping for quality. Since all of these lots meet the grade A requirement anyways, we thought it would be interesting to separate the lots that we thought contained the most desirable flavours for this year. From now on, we will offer only "village lots" from Rushashi, as the collection points correspond to villages where the coffee is produced. For the 2016 season, we bagged and bought all the coffee from the villages of Burimba and Minazi. We hope that by setting this example, we will encourage coops and exporters all over the country to also create the closest thing possible to microlots in a setup with cherry collection points. Soon perhaps, not just washing stations, but even the tiny villages that supply them can feel the pride of having their coffee promoted worldwide, hopefully adding to the coffee's quality and farmer premiums. Having received feedback on the village lots we pioneered last year, we have been able to conclude that Minazi and Burimba had quite distinct taste features. Whereas Minazi was more fruity and acidic, Burimba exhibits more body. In terms of application, this meant that more roasters preferred Burimba for espresso and milk-based drinks, and Minazi became more popular in its lighter roast form. This year, we have added a third village, Rutabo, to our import list. Early harvest samples showed it was more floral still than even Minazi. Importantly, the coffee washing station Rushashi has been organic certified this year - a crown on years of hard work to become one of the country’s first fully organic washing stations - in a country that is still very much defined by its chemical fertilisation and pest control solutions. After resounding success of the natural lot (and seeing it win numerous competitions throughout Europe), we asked Antoine to expand the village lot sorting to the naturals this year. He was able to create a Minazi and Rutabo natural lot, which is so popular that in some cases, it has replaced the washed lot in roasters’ and cafés’ assortment. We welcome this change and experimentation as it brings a completely new dimension to what customers can expect in terms of “typically Rwandan” flavours. In February of 2019, Lennart went to visit Rushashi for the first time in three years. It was touching to see the changes that were implemented in this short time: the new community centre, the new nursery, the improvements to the mill and the vibrant women’s organisation Hingakawa were a joy to see, it affirms the cooperative’s strong standing as an example for rural Rwanda, now even more as five years ago when we started working together. The next step, we all agreed, for the coop is to go one step beyond organic and start to implement agroforestry practices throughout their members’ coffee fields. We are working to establish a consortium with local agronomists and agroforestry organisations - while at the same time starting a pilot this season. The aim is to have an example case to show farmers within five years: a fully reforested plot where all fertilisation, soil and water management and pest control is done automatically - by nature itself.